When it comes to radios and speakers, the market is rather well saturated. It is hard to stand out from the crowd, and different companies focus on different features to get themselves shine. Goodmans are an already well established brand, and for the Heritage Portable, they have gone for extreme connectivity. 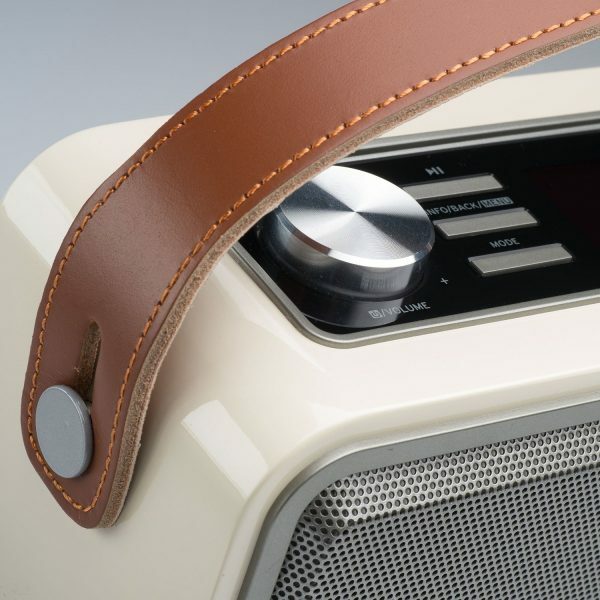 The device features everything from FM and DAB+, all the way up to Internet Radio and Spotify Connect. Goodmans have also thrown in Bluetooth audio streaming, and just in case you were fussy, there is even NFC pairing. And yeah, there is also audio in and audio out. As I was reading about this, I kept noticing people making one observation over and over again. The radio is rather beautiful to look at. There is attention to detail, and while it is going with the ‘almost everyone does it’ vintage look, it does it well. It does not feel cheap or plasticcy, and the buttons and knobs have a nice and smooth feel to them as well. In fact, it wouldn’t be wrong to say that pictures don’t really do it justice. The front features the logo as well as the stereo speakers (2 x 12W). The top features some control options, six buttons, and a high contrast screen. The back gives you access to the power point, a rocker on/off switch, Audio in and out, as well as a USB B type plug (same as your printer) which is designed to let you update software. Being in line with current trends, OTA updates are also available for the device, so you will probably never need to use this port. You will also find a telescopic antenna at the back, and that is really designed for DAB+ reception. You don’t really need to use it for WiFi and Internet. The setup is fairly simiilar to almost any other Internet Radio for the Internet Radio bit. You turn it on, it asks if you want to scan for WiFi, you pick your one, and you either choose WPS, or enter your own password manually using the knobs. For DAB+ and FM, you do the same as always as well. When you go to those modes, it will run a scan for you, and give you all the channels you can access. Bluetooth is, and I begin to sound boring here, fairly straight forward to. Go to Bluetooth mode and look for it via your phone or device, and you should be good to go. There is even NFC in there in case you can’t be bothered to go through your phone’s settings to set it up. Once setup, you don’t really have to change things around much. However, using the menu key, you have the option to run setup wizard again, or do another scan. It guides you through the process so you don’t really have much to worry about. Yes, indeed. Goodmans have really gone the extra mile when it comes to giving you every single element of connectivity you can ask for in a radio. You have everything. In fact, I think you will struggle to find a similar priced radio/device that offers you so many bells and whistles. Internet Radio and Spotify connectivity are definitely great, but the real bonus here is the multi-room ability. 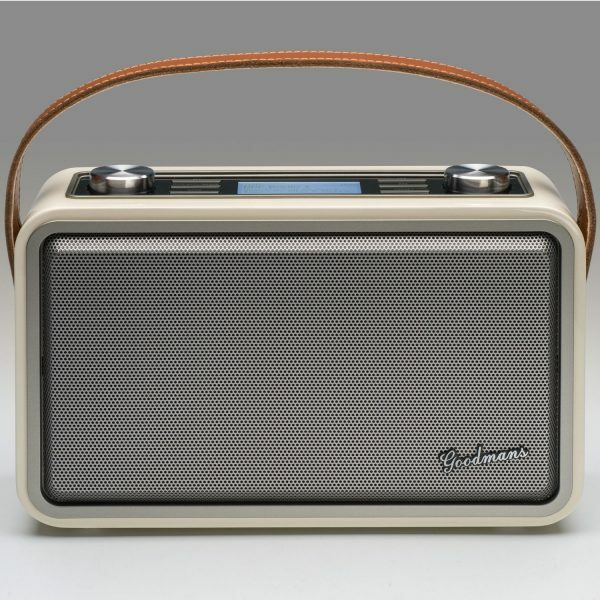 The radio being portable gives you the impression that it is designed for fairly basic kitchen/bedroom use, but combine this and a few others, and you can have a whole party going. This works using the UNDOK app, and while most competitors use propriety methods, Goodmans have gone for more of an industry standard. In fact, Roberts, another well known brand, have also gone for UNDOK for their multi-room device. So far, so good eh. In fact, rather impressive. So what about the biggest test of it all? At the end of the day, all such devices will be judged by their sound quality, and annoyingly the Heritage Portable falls short of perfection here. The device suffers something that is rather common in a lot of speakers, which is bass distortion when you turn the volume up. You can change the settings around a bit, but sadly this is still obvious at higher volumes. Treble is sharp, and overall the sound is good for most radio, but if you are the fussy kind of listener, you will notice that the device falls ever so short when put to the test. In many ways this is a shame as up till this point, the device has been nothing but amazing, both in looks and functionality. The radio even packs in a portable battery to let you go up to 8 hours between charges. The charger is not one of your micro USB jobs, so you can’t really swap it with something else, but if you are the careful type (and leave it plugged in), you really shouldn’t have a problem. The battery life rating of around 8 hours delivers, and the portability on offer is definitely appreciated. 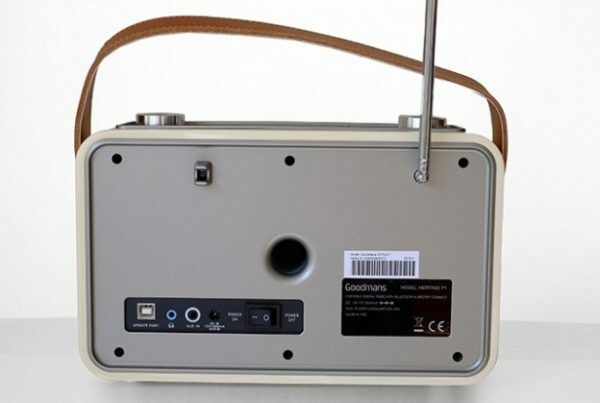 More information on the Goodman’s Heritage Portable can be found on their website. It retails from around £169 and can be bought via various online retailers including Amazon. This is an amazing device which offers an amazing set of features at a pretty decent price. Sadly the sound quality doesn’t match the bar it has set for itself, and in many ways that is a shame. However, with the Heritage range, and the Heritage Portable in general, Goodmans is setting a good standard for being the go to device for your home audio needs.